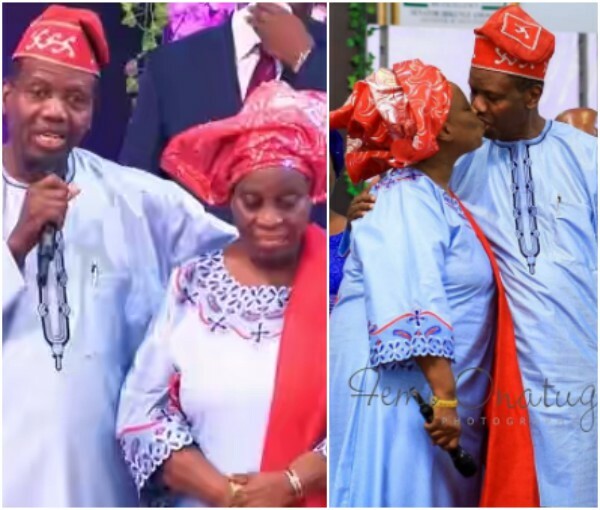 The General Overseer of the Redeemed Christian Church of God, Pastor Enoch Adeboye has told those planning to touch his wife, to back off or be prepared to die. Pastor Adeboye who preached a sermon titled 'Activating Your Destiny' at the National Headquarters of RCCG, Throne of Grace Parish, EB.utte Metta, Lagos, further said that though he can’t do anything to anybody who slaps, criticizes or lies against him, but to do such against his wife of 50 years, he would kill the person. In his sermon, he urged those seeking life partners to marry for love because, such love endures for long, as he is still on honeymoon, despite being married for a long. He also urged ladies to marry a pastor if they wanted an influential man. “Be ready to lay down your life for your partner if you’re truly in love. My wife doesn’t like me saying this: “You can slap me; you can lie against me, you can criticise me, it doesn’t bother me, but touch my wife, I’ll kill you! I want the world to hear. “Marry for love. It’ll endure. I’ve been married for 50 years and still on honeymoon. I was the poorest among those lurking around the girl I married. One was a lawyer who had a car; I had nothing. But I told the girl that if you marry me, whatever I am, wherever I ever become, will be yours”.